Mainstream media is completely silent on this story, so it is up to you to share the findings of this important research with everyone you know. 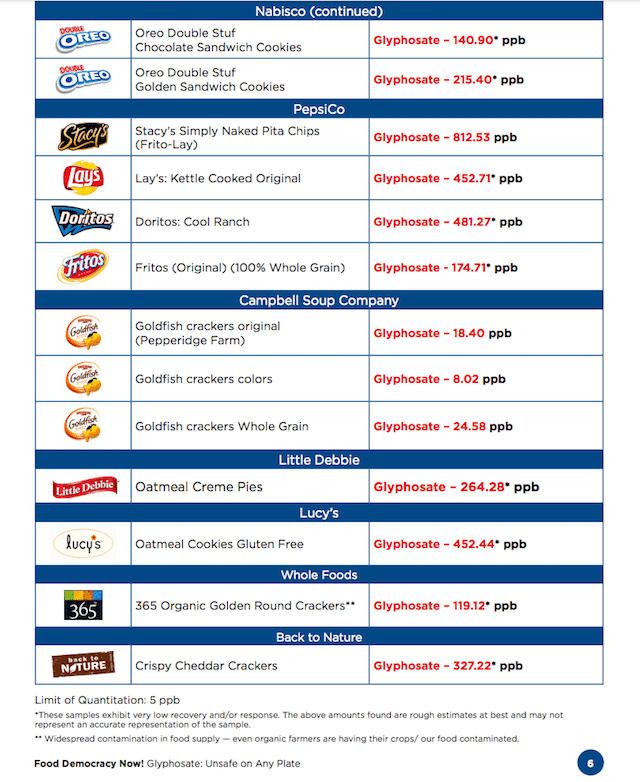 New testing conducted by an FDA-registered food safety lab found alarming levels of the chemical glyphosate (known as Monsanto’s Roundup weed-killer) in several very common foods. 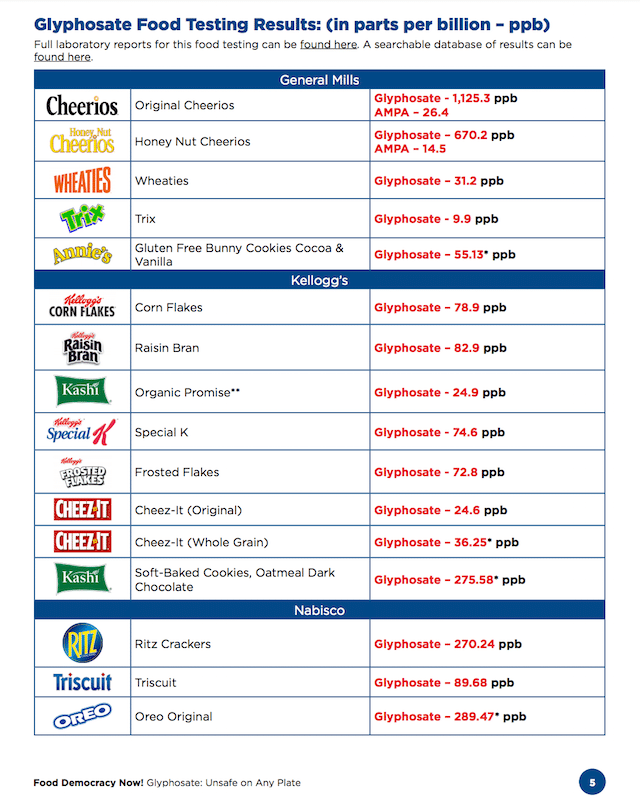 This independent research reveals that many popular foods have over 1000 times the glyphosate levels that have been established to be harmful. “With the widespread increase in glyphosate use over the past 20 years and the fact that independent science has confirmed low level exposure to Roundup causes liver and kidney damage at only 0.05 ppb glyphosate equivalent, as reflected by changes in function of over 4000 genes, the American public should be concerned about glyphosate residues on their food. Below are two images that show food testing results published by Food Democracy Now! and The Detox Project, which commissioned the research. Full laboratory reports for this food testing can be found here. A searchable database of results can be found here. It is no surprise that Monsanto does not want the public to know about these food safety test results. They pay-off mainstream media outlets and regulatory agencies, keeping the media silent when independent research such as this is published, so they can continue making billions from selling glyphosate. This new research is only supplement to numerous other independent studies that basically show that Monsanto is poisoning us with glyphosate and the government is doing nothing to stop it. Read: Dramatic Increase in Kidney Disease in the US and Abroad Linked To Roundup (Glyphosate) ‘Weedkiller’; and Glyphosate (Roundup) Carcinogenic In the Parts Per Trillion Range. It is up to each person who sees this story to share it and help others realize that Monsanto is poisoning our food.